Counteract the cold winter season’s shorter and darker days by using a few of these bright ideas. It’s important to keep your home feeling warm, bright and cheerful during the winter time. Have a look at how Eveready’s lighting products can help you brighten your home in no time this winter. A neat idea from House Beautiful is to fit a low-hung pendant in your bedroom rather than opting for a table lamp. Eveready’s CFL Mini Spiral Lamps are an ideal bulb to use next to bedside tables as they offer a warm white light and create soft relaxed ambience for the bedroom. While providing enough light bright enough for reading. 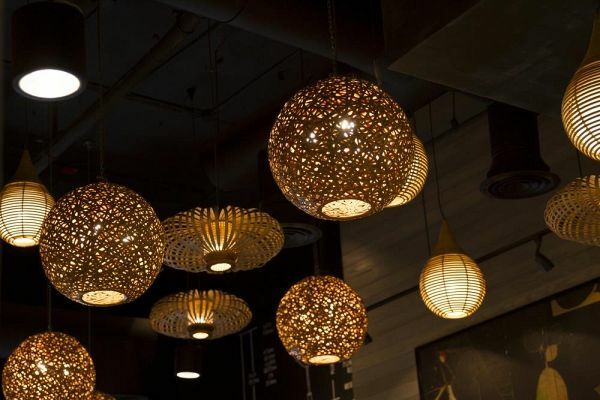 When choosing a woven hanging light fitting it also allows light to filter through gently across the room and creates beautiful patterns on the walls. When lighting up your living room, don’t forget the walls. Wall lighting fixtures come in different styles, including spotlights and up lighters. When choosing your lighting for your living room, our CFL Reflectors will work perfectly as they provide the perfect accent light for highlighting your wall mounted lamps and the good colour rendering index of the bulbs will create a cosy ambience which will help create a warm and radiant atmosphere. A standing floor lamp is essential to the design of a living room, as depending on the design of the lamp it can either make a statement or the correct lighting can determine the whole mood of the room. When deciding on the perfect floor lamp take into consideration the size of your living area. Will you be going for a floor lamp which is a feature in itself that your guests will comment on or would you prefer a lamp which goes unnoticed? Next, you need to decide on the kind of light that you would like in your living room, as standing lamps can be used for both task lighting and ambient lighting. 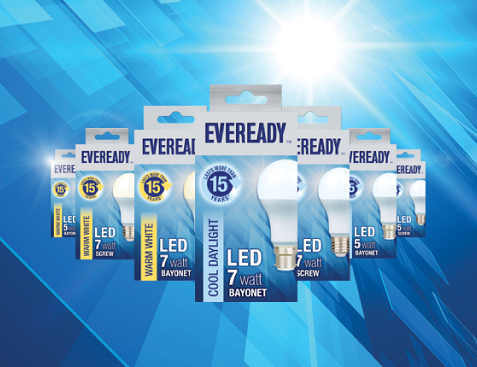 If your lamp will be near your sofa to provide lighting for reading then we suggest you use Eveready’s CFL Mini Spiral Lamps and choose the Cool Daylight bulbs which provide light bright enough for reading. If your standing lamp is more of a feature for your living room then our CFL 3U Lamps are ideal as they are available in Warm White and create a warm romantic ambience in your living area. Some universal tips to keep in mind when lighting a kitchen is to remember that kitchens have become so much more than a food prep space, but it has become an entertainment area as more homes have open plan kitchen and living areas. With this in mind when choosing the perfect lighting you need to keep in mind that the lighting needs to be both task–oriented as well as ambient and friendly. A mixture of downlights, under-cabinet strip lighting and hanging lighting is best to use in the kitchen. Have a look at Eveready’s LED Downlighters which are important as they are dimmable so the light can be adjusted to meet specific needs. This is also a great option when your kitchen is an open plan as you can dim the lighting once the food prep is done to create a lovely ambience. A good outdoor lighting can be seen when the sun goes down and the house appears welcoming as there are no dark shadows and entrances, as everything is well-lit, safe and beautiful. There are a few pointers to keep in mind when lighting outside, firstly make sure all entrances, paths and staircases are well-lit. Another important outdoor lighting tip is to add lighting security which is where outdoor lights come on with motion sensors. Eveready’s CFL 3U Day/Night Sensor Lamps are ideal as they switch on and off when they detect motion, which is a great extra security feature.